Deborah Stevenson's lifelong love of animals and writing have frequently intersected over the years, resulting in numerous articles written for animal-related publications, websites, a regular column for JustFrenchies magazine, and children's books. When her son was young, reading together was a treasured time they shared. This spurred her desire to write books that other parents could enjoy with their children. Currently a product marketing manager, Deb also worked as a technical writer for over a decade. She lives in New Jersey with her son and their three dogs, and enjoys training for and competing in the sport of dog agility. Soaring Soren: When French Bulldogs Fly is a children's animal book, based on a true story, written by Deborah Stevenson and illustrated by Morgan Spicer. Deb was there at the airport waiting for the small French Bulldog puppy who had traveled all the way to her from Denmark. She greeted him with hugs and french fries, and he instantly fell in love with her. Deb explained that he was going to train to be a show dog, and she helped him learn the correct posture and behavior that would be expected. All too soon, however, Deb realized that her pup was just too big to be a show dog. Watching him jump, play and cavort outdoors had her thinking what many thought was improbable -- her French Bulldog could become an Agility Champion. The two of them worked hard to get Soren to master the jumps, A-Frames and weave poles that were used in agility trials. Soren and Deb heard others at the first trial say that French Bulldogs just couldn't do agility, no less be a champ, but they knew better. Soren had what it takes to win. 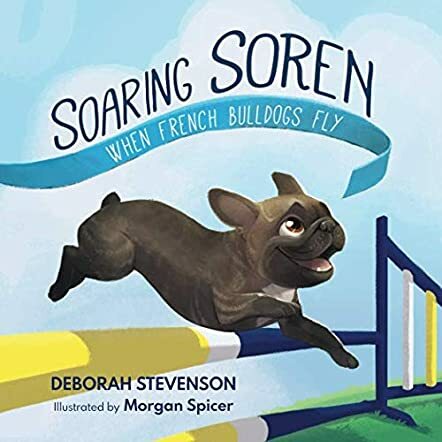 Deborah Stevenson's children's animal book, Soaring Soren: When French Bulldogs Fly, is an inspirational and exciting true life story that shows how even seemingly insurmountable odds can be overcome, if you believe in yourself. What a marvelous way to teach children to have confidence in their abilities! Soren's story is beautifully told, from that first plane trip through to the celebration after Soren wins the honor of being the first ever French Bulldog AKC Master Agility Champion. Morgan Spicer's illustrations are masterful and bring this remarkable story to life. Each panel is colorful and shows Soren as he soars over jump bars and successfully navigates the dreaded weave poles. Stevenson also provides a link to Soren's site, which has photographs and a video showing Soren in action. I loved this book! Soaring Soren: When French Bulldogs Fly is most highly recommended for children and animal lovers of all ages. A lovely and inspiring story. I met the author through a friend. I had heard her dog Soren was an agility champ. I innocently asked, "is Soren a cattle dog or a border collie--what kind of dog does Deb have?". The reply was "a french bulldog". I laughed at the joke. But Soren was not a joke; rather a rare breed--a gifted athlete, loyal companion, best friend, and small dog with a big attitude. I learned to never assume...and that attitude means everything. Soren has since crossed the rainbow bridge. I know she misses him and wished to honor his memory. This book is his, and Deb's, gift to us. What a great true story! Who doesn’t love rooting for the underdog? Especially an actual dog as cute as Soren the French Bulldog. In "Soaring Soren, When French Bulldogs Fly" by Deborah Stevenson, the title character comes to the United States with hopes of being a show dog and thereby pleasing his new owner. But early on it becomes clear that Soren has grown a little too big to be a show dog and he worries this will make his owner sad. One day however, she notices that Soren has some athletic talents and might instead make a great agility dog. This begins their quest to win that championship even though a French Bulldog like Soren has never won the title. Cleverly written as a narrative told by Soren himself, the story of his training and ultimate competition is beautifully explored and the anticipation builds throughout. The illustrations are expressive, colorful and (as a dog owner myself) delightfully realistic. As a story, the messages for children are important ones; that no matter what others might say or think you need to remain true to yourself; you may not always fit the mold, but you can achieve anything you put your mind to; and to never be afraid to try a different path in life. I also love the owner/pet relationship depicted in the book. Soren seems to always be enjoying himself as he works toward his goal and his owner is ever supportive and nurturing. It’s a perfect if subtle modeling of a wonderful parent/child connection. "Soaring Soren, When French Bulldogs Fly" is a delight and the fact that it’s a true story is just an extra doggie treat. Soren will stay with me for a long time. I loved this book and you and your children will too. - Rick Felty, Author of the award-winning Tabitha Fink series including his latest book, "Tabitha Fink and the Patchwork Pirates."